The Chilean Nobel Laureate poet Pablo Neruda may be one of the greatest poets in the Spanish language. His poetry is hard to translate and there is only a small amount in English. It is difficult for me and also for many Chileans to disassociate his words from his intense political views and/or personal failings. He wrote exquisite poems about love and human nature. 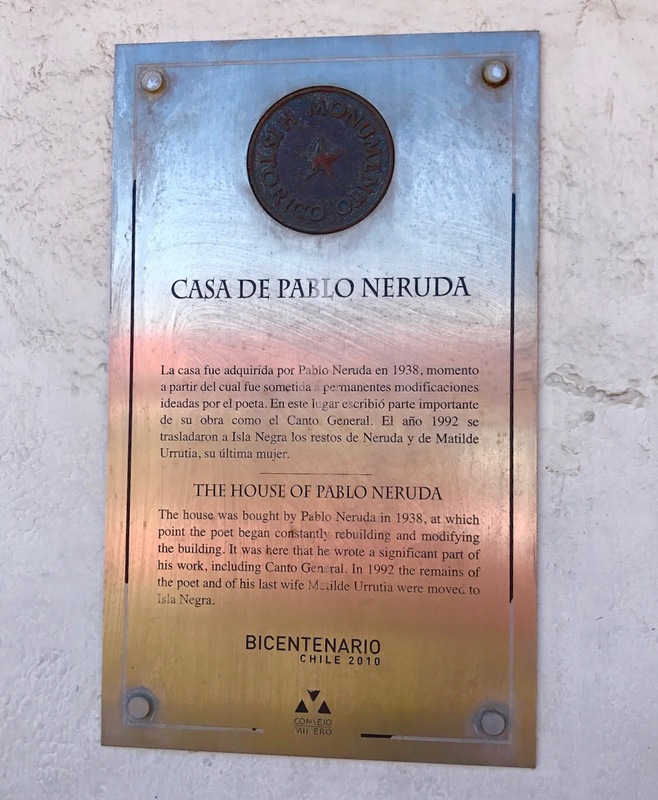 Neruda has three houses—one on San Cristobal Hill in Santiago, another in Valparaiso and the third is in Isla Negra. I visited two of them. To decorate his houses he has scoured antique shops and junkyards for all kinds of objects. He has many collections. Each object reminds him of an anecdote. You can not photograph inside. Riding the funicular to the top of Parque Metropolitano is the classic tourist activity in Santiago. 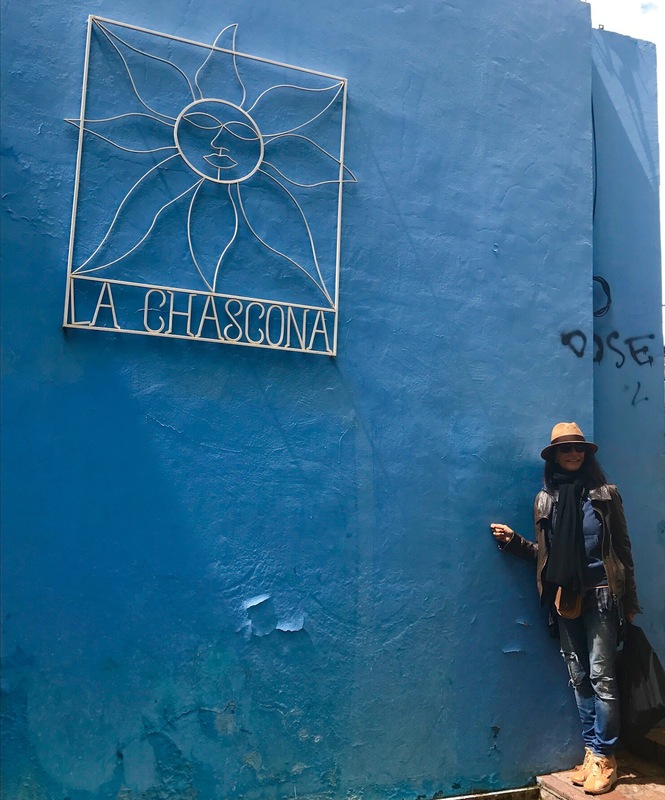 When we got to the bottom again, it deposited us a block away from La Chascona, the house the poet bought in 1951 for his then-secret lover, Matilde Urrutia. La Chascona (the name refers to the wild tangle of Matilde’s hair, a recurring element in his poems) is a house filled with objects – not for their value or beauty, but as an expression of the person who assembled them. It was destroyed in a military coup after his death and has been rebuilt and restored. For a Communist, he is quite the shopper. Isla Negra (Black Island) is neither black nor an island. It is an elegant beach resort forty kilometers south of Valparaíso. No one knows where the name comes from; Neruda speculates about black rocks vaguely shaped like an island which he sees from his terrace. 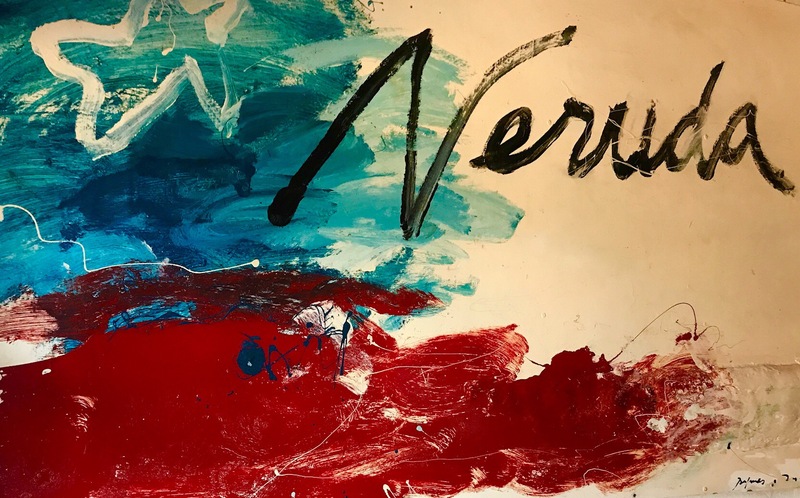 Thirty years ago, long before Isla Negra became fashionable, Neruda bought—with the royalties from his books—six thousand square meters of beachfront, which included a tiny stone house at the top of a steep slope. 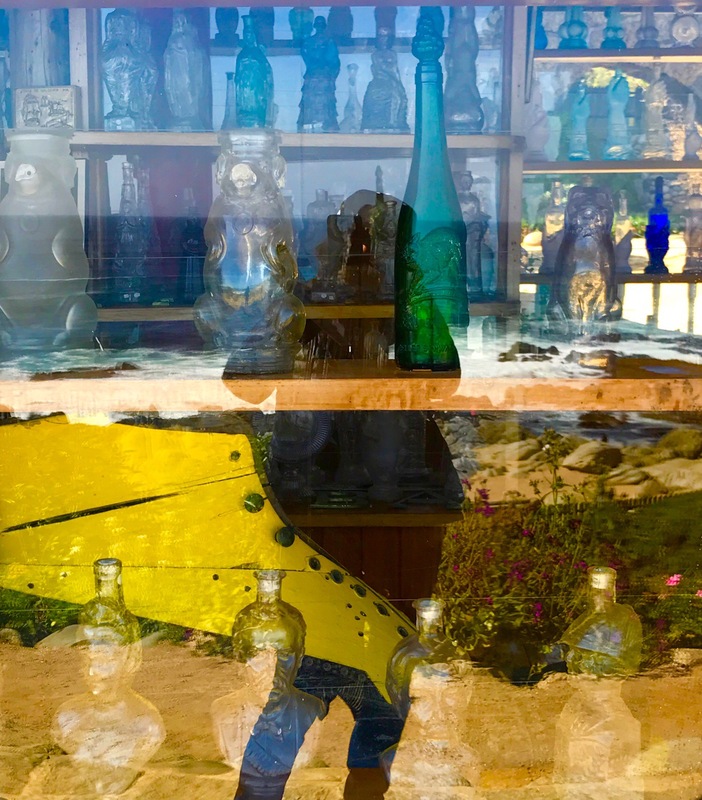 “Then the house started growing, like the people, like the trees.” His collections of bottles, nautical things and odd objects grew as well. l love these collections and I love this house with its magic light and expansive views. It is at Isla Negra where Pablo Neruda and his third wife, Matilde have established their most permanent residence. His most iconic works were written here. It is where he was happiest entertaining a constant stream of visitors with Chilean wine and food. The names of his dead friends are carved in the beam above the bar so he can always have a drink with them. There are seventeen names. When he died, which was during the Pinochet reign of terror, Neruda was given a pauper’s grave. Chile didn’t officially embrace its most famous writer until democracy was restored in 1990. Then he and Matilda were buried outside facing the sea according to his wishes. 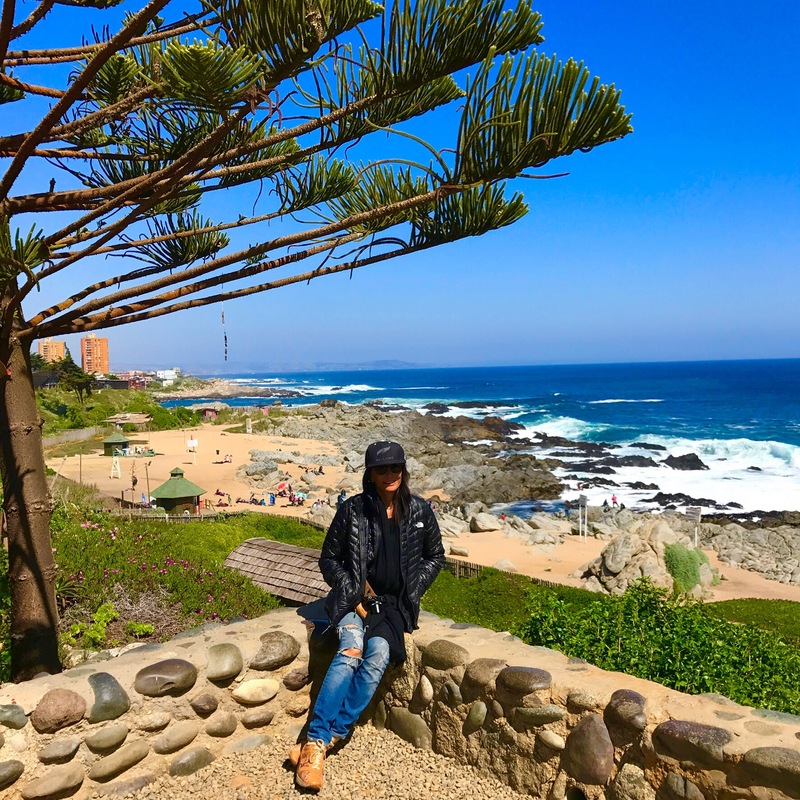 This entry was posted in travel and tagged Isla Negra, la Chascona, Matilde Urrufia, Pablo Neruda, Pinochet, poet, Santiago, Valparaiso by jaynezak. Bookmark the permalink.